At least 22 cities, from Baltimore to Denver, have created leadership roles for change-makers focused on food. Standing at the front of a dimly-lit room inside the National Western Stock Show, a sprawling complex on the north end of Denver, Blake Angelo, the city’s food systems development manager, invited a roundtable audience to speak up about the changes they want to see in their neighborhoods with regard to food. The room was filled with residents of nearby neighborhoods that are predominantly Hispanic, low-income, and where fresh food is hard to come by, and the opinions ranged from support for local entrepreneurs to rejecting big-box stores as the solution to their food desert problem. Citywide, one in six people is food-insecure, but as in other cities, some communities face more acute challenges than others. Nearly half (49 percent) of the low- to moderate-income Denver neighborhoods lack convenient access to grocery stores. In the larger metro region, about five percent of the population is low-income and has little access to healthy food within a mile from home; in Elyria-Swansea, one of the nearby neighborhoods, that number jumps to 70 percent. This particular meeting was part of Local Foods, Local Places, a national initiative, but Angelo, Denver’s first food systems manager, had held similar community “listening sessions” all through the spring in neighborhoods around the city. Community residents were invited to propose ways to bring more healthy food to their neighborhoods, and those ideas will eventually help shape the first-ever Denver Food Plan. The plan is one of the first major milestones for Angelo’s office, and marks the first comprehensive effort undertaken by the city to study, and dedicate efforts to improve, the local food system. The very existence of Angelo’s position, created less than two years ago, also points to a national trend. A growing list of cities have established an office within local government dedicated to food, much like they have departments for transportation and education—if smaller in size. Until recently, the many disparate elements of the food system—from production to land prices, to local distribution challenges, to zoning hurdles for retailers—have often been viewed in isolation. But as more of these positions appear, it may be a sign that cities are beginning to see food in a new holistic light. The specifics of the food policy positions vary from city to city, with most focused on (and housed in the office of) sustainability or health, while others, as in Denver, are using food as a tool for economic development, and vice versa. The underlying force, though, is the same: Cities are recognizing the chronic health and economic challenges that persist in communities with little access to healthy food, and the fact that local government can play a role in improving the food environment—through policy that impacts everything from land use to transit. That was a question Baltimore decided to tackle when it hired Holly Freishtat in 2010 as one of the first food policy directors in the country. Since then, Baltimore has worked to establish a personal property tax credit for supermarkets to open in neighborhoods deemed “food deserts”; increased the amount of healthy food sold at corner stores and the city’s public markets; changed zoning to allow more agricultural uses and created a property tax credit for urban farms; and partnered with ShopRite to allow for online grocery ordering and delivery to seniors, the disabled, and public housing. This last program is a unique effort, known as the Virtual Supermarket, which worked with ShopRite to accept Supplemental Nutrition Assistance Program (SNAP) payment (or “food stamps”) upon delivery. (SNAP can’t otherwise be used to pay for online transactions—yet.) Last year, Baltimore also released its second food environment map, in partnership with Johns Hopkins’ Center for a Livable Future, to help inform its various efforts and strategies. The U.S. Conference of Mayors has encouraged cities to create food policy positions since it created the task force, which doesn’t have formal membership, but now has about 22 cities engaged in its monthly calls, including Austin, Louisville, and Seattle. What each city does as a result of that office looks different—but they often start with some kind of citywide map or plan, in order to ensure that the director’s efforts are going to meet the city’s most pressing needs. In Minneapolis, Tamara Downs Schwei, the local food policy coordinator, has worked to get more support for and started tracking metrics across farmers’ markets, reduce the fees and permits required for food trucks operating at those markets, among other things. In Austin, the Sustainable Food Policy Manager Edwin Marty is focused in part on working with local restaurants, businesses, and neighborhoods to start implementing the organic waste diversion goals laid out in the city’s Universal Recycling Ordinance. In New York City, Food Policy Director Barbara Turk has focused on nutrition education, increasing food security, and has helped overhaul its institutional purchasing plan, calling on the city to buy more locally-sourced food. New York also now claims to be the first major U.S. city to set nutrition standards for all foods it buys and or serves. For Turk, buying local, healthier food not only benefits New Yorkers, but because of the city’s size—and the compound effect with other cities making similar changes—it can also have a ripple effect on other customers buying from the same suppliers. For this reason, food policy managers sometimes collaborate or share ideas; Freishtat said that the Virtual Supermarket program sparked a conversation with other directors, who are now collaborating to help SNAP users shop for food online. But, she emphasizes, the primary value of her office really lies in the policy changes she can bring to Baltimore. 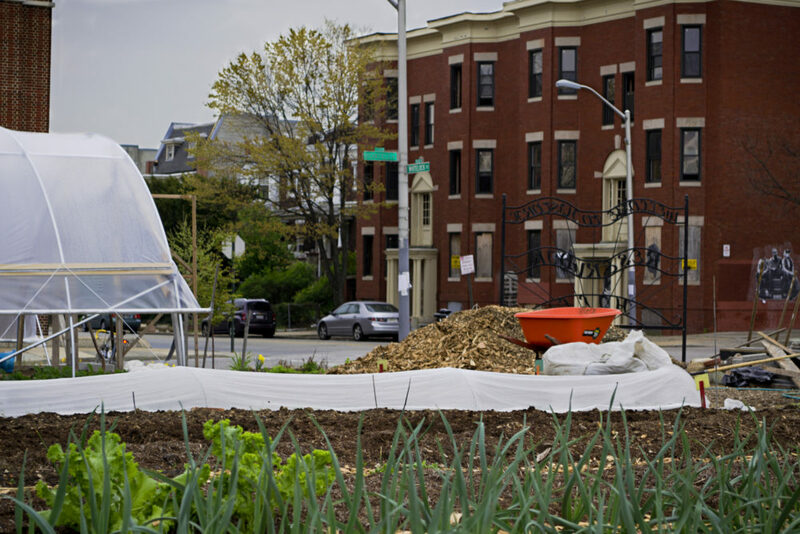 Photos from top: An urban farm in Baltimore (photo by Mark Dennis); Denver’s food systems development manager, Blake Angelo; Baltimore’s food policy director, Holly Freishtat. City of Atlanta has an Urban Agriculture Director.